For the islands of the sovereign state, see Saint Kitts and Nevis. For other uses, see Kitts (disambiguation) and Nevis (disambiguation). Saint Kitts and Nevis (/kɪtsˈniːvɪs/ ( listen)), also known as the Federation of Saint Christopher and Nevis, is an island country in the West Indies. Located in the Leeward Islands chain of the Lesser Antilles, it is the smallest sovereign state in the Western Hemisphere, in both area and population. The country is a Commonwealth realm, with Elizabeth II as queen and head of state. 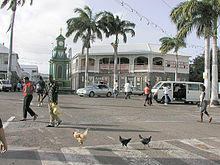 The capital city is Basseterre on the larger island of Saint Kitts. The smaller island of Nevis lies approximately 3 km (2 mi) southeast of Saint Kitts across a shallow channel called "The Narrows". The British dependency of Anguilla was historically also a part of this union, which was then known collectively as Saint Christopher-Nevis-Anguilla. To the north-northwest lie the islands of Sint Eustatius, and Saba, Saint Barthélemy, Saint-Martin/Sint Maarten and Anguilla. To the east and northeast are Antigua and Barbuda, and to the southeast is the small uninhabited island of Redonda, and the island of Montserrat, which currently has an active volcano (see Soufrière Hills). Saint Kitts and Nevis were among the first islands in the Caribbean to be settled by Europeans. Saint Kitts was home to the first British and French colonies in the Caribbean, and thus has also been titled "The Mother Colony of the West Indies". 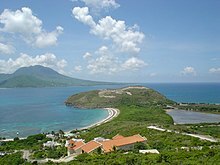 Saint Kitts was named "Liamuiga", which roughly translates as "fertile land", by the Kalinago who originally inhabited the island. The name is preserved via St. Kitts's western peak, Mount Liamuiga. Nevis's pre-Columbian name was "Oualie", meaning "land of beautiful waters". Christopher Columbus upon sighting what is now Nevis in 1493 gave that island the name San Martín. The current name "Nevis" is derived from a Spanish name Nuestra Señora de las Nieves. This Spanish name means Our Lady of the Snows. It is not known who chose this name for the island, but it is a reference to the story of a fourth-century Catholic miracle: a summertime snowfall on the Esquiline Hill in Rome. Perhaps the white clouds which usually wreathe the top of Nevis Peak reminded someone of the story of a miraculous snowfall in a hot climate. The island of Nevis upon first British settlement was referred to as "Dulcina", a name meaning "sweet one" in Spanish. Eventually the original Spanish name was restored and used in the shortened form, "Nevis". There is some disagreement over the name which Christopher Columbus gave to St. Kitts. For many years it was thought that he named the island San Cristóbal, after Saint Christopher, his patron saint and the patron hallow of travellers. New studies suggest that Columbus named the island Sant Yago (Saint James). The name "San Cristóbal" was given by Columbus to the island now known as Saba, 20 mi northwest. It seems that "San Cristóbal" came to be applied to the island of St. Kitts only as the result of a mapping error. No matter the origin of the name, the island was well documented as "San Cristóbal" by the 17th century. The first English colonists kept the English translation of this name, and dubbed it "St. Christopher's Island". In the 17th century, a common nickname for Christopher was Kit, or Kitt. 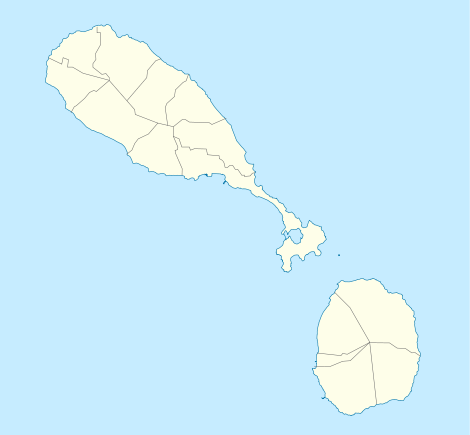 This is why the island was often informally referred to as "Saint Kitt's Island", further shortened to "Saint Kitts". Today the Constitution refers to the state as both "Saint Kitts and Nevis" and "Saint Christopher and Nevis", but the former is the one most commonly used. The name of the first inhabitants, pre-Arawakan peoples who settled the islands perhaps as early as 3000 years ago, is not known. They were followed by the Arawak peoples, or Taíno about 1000 BC. Peak native populations occurred between 500 and 600 AD. The warlike Island Caribs invaded about 800 AD. They had expanded north of St. Kitts by the time of the Spanish conquest. In 1623, the island was settled by the English, soon followed by the French; both agreeing to partition the island. The Spanish were superior to the Kalinagos in terms of warfare, and the French and English were even more "economically aggressive and militarily determined" than the Spanish. The French and English, intent on self-enrichment through exploitation of the island's natural resources, understood from the start that their establishment of settlements in St. Kitts would be met with resistance, and such resistance was waged by the Kalinago throughout the first three years of the settlements' existence. Throughout the process of establishing settlements on St. Kitts, as elsewhere in the Caribbean, the French and the English, like their predecessors, were intent on enslaving, expelling or exterminating the Kalinagos, since the latter's retention of land threatened the profitability of the European-controlled plantation economy. To facilitate this objective, an ideological campaign was waged by colonial chroniclers, dating back to the Spanish, as they produced literature which systematically denied Kalinago humanity (a literary tradition carried through the late-seventeenth century by such authors as Jean-Baptiste du Tertre and Pere Labat). In 1626, the Anglo-French settlers joined forces to massacre the Kalinago, allegedly to pre-empt an imminent plan by the Caribs, conniving with the Kalinagos, to expel or kill; or, according to Tertre's account, just kill the European colonialists who had maintained their presence on the island by force for three years. 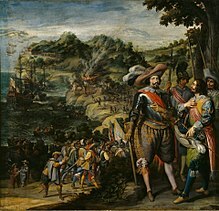 A Spanish expedition sent to enforce Spanish claims destroyed the English and French colonies and deported the settlers back to their respective countries in 1629. As part of the war settlement in 1630, the Spanish permitted the re-establishment of the English and French colonies. As Spanish power went into decline, Saint Kitts became the premier base for English and French expansion into the Caribbean. From St. Kitts, the British settled the islands of Antigua, Montserrat, Anguilla and Tortola, and the French settled Martinique, the Guadeloupe archipelago and St. Barts. During the late-seventeenth century, France and England fought for control over St Kitts, with Brimstone Hill Fortress begun circa 1690. The French ceded the territory to the UK in 1713. At the turn of the eighteenth century, St. Kitts was the richest British Crown Colony per capita in the Caribbean, a result of the sugar trade. Although small in size and separated by only 2 miles (3 km) of water, the two islands were viewed and governed as different states until the late-nineteenth century, when they were forcibly unified along with the island of Anguilla, by the British. To the present day, relations are strained, with Nevis accusing Saint Kitts of neglecting their needs. Saint Kitts and Nevis along with Anguilla, became an associated state with full internal autonomy in 1967. Anguillians rebelled and separated from the others in 1977. St. Kitts and Nevis achieved independence from the United Kingdom in 1983. It is also the newest sovereign state in the Americas. In August 1998, a vote in Nevis on a referendum to separate from St. Kitts fell short of the required two-thirds majority. In late-September 1998, Hurricane Georges caused approximately $458,000,000 in damages and property and limited GDP growth for the year and beyond. Georges was the worst hurricane to hit the region during the twentieth century. Government House, Basseterre, is the official residence of the Governor-General of Saint Kitts and Nevis. Saint Kitts and Nevis is a sovereign, democratic and federal state. The Queen of Saint Christopher and Nevis, Elizabeth II, is its head of state. The Queen is represented in the country by a Governor-General, who acts on the advice of the Prime Minister and the Cabinet. The Prime Minister is the leader of the majority party of the House, and the cabinet conducts affairs of state. The country may also be described by the unofficial term, "Commonwealth realm", because it is a constitutional monarchy which shares the same monarch as fifteen other members of the Commonwealth of Nations. St. Kitts and Nevis has a unicameral legislature, known as the National Assembly. It is composed of fourteen members: eleven elected Representatives (three from the island of Nevis) and three Senators who are appointed by the Governor-General. Two of the senators are appointed on the advice of the Prime Minister, and one on the advice of the leader of the opposition. Unlike in other countries senators do not constitute a separate Senate or upper house of parliament, but sit in the National Assembly alongside representatives. All members serve five-year terms. The Prime Minister and the Cabinet are responsible to the Parliament. Saint Kitts and Nevis has no major international disputes. Saint Kitts and Nevis is a full and participating member of the Caribbean Community (CARICOM) and the Organisation of Eastern Caribbean States (OECS). The Charter of the OAS was signed in Bogota in 1948 and was amended by several Protocols which were named after the city and the year in which the Protocol was signed, such as Managua in 1993 forming part of the name of the Protocol. St. Kitts & Nevis entered the OAS system on 16 September 1984. Three Indigenous Leaders Summits of Americas (ILSA) have been held with three past Summits, which were: Canada, Argentina and Panama. It was the intention of the leaders to have this Summit within the framework of that which was held in Trinidad and Tobago in 2009. The position of the OAS with respect to indigenous persons appears to be developing over the years. The following statements appear to capture the position of the OAS with respect to the ILSA as at December 2016 according to the website of the Summit of Americas: "The OAS has supported and participated in the organisation of Indigenous Leaders Summits of Americas (ILSA)," according to the OAS's website. "The most recent statement made by the Heads of State of the hemisphere was in the Declaration of Commitments of Port of Spain in 2009 - Paragraph 86". At a CARICOM Meeting, representative of St. Kitts & Nevis, Kennedy Simmons signed The Double Taxation Relief (CARICOM) Treaty 1994 on the 6 July 1994. The representatives of seven CARICOM countries signed similar agreements at Sherbourne Conference Centre, St. Michael, Barbados. The countries whose representatives signed the treaties in Barbados were: Antigua and Barbuda, Belize, Grenada, Jamaica, St. Lucia, St. Vincent and the Grenadines and Trinidad and Tobago. On 30 June 2014, St. Kitts & Nevis signed a Model 1 agreement with the United States of America in relation to Foreign Account Tax Compliance Act (FATCA). At 28 April 2016, the status of the agreement went to "In Force" according to the updated site on 16 January 2017. Saint Kitts and Nevis has a defense force of 300 personnel. It is mostly involved in policing and drug-trade interception. The federation of Saint Kitts and Nevis is divided into fourteen parishes: nine divisions on Saint Kitts and five on Nevis. The country consists of two main islands, Saint Kitts and Nevis. The highest peak, at 1,156 metres (3,793 ft), is Mount Liamuiga on St. Kitts. The southernmost point is Dogwood Point on Nevis. The islands are of volcanic origin, with large central peaks covered in tropical rainforest; the steeper slopes leading to these peaks are mostly uninhabited. The majority of the population on both islands lives closer to the sea where the terrain flattens out. There are numerous rivers descending from the mountains of both islands, which provide fresh water to the local population. St. Kitts also has one small lake, a salt pond. The national bird is the brown pelican. There are 176 species of birds. By the Köppen climate classification, St. Kitts has a tropical savanna climate (Köppen Aw) and Nevis has a tropical monsoon climate (Köppen Am). 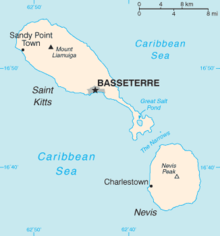 Mean monthly temperatures in Basseterre varies little from 23.9 °C (75.0 °F) to 26.6 °C (79.9 °F). Yearly rainfall is approximately 2,400 millimetres (90 in), although it has varied from 1,356 millimetres (53.4 in) to 3,183 millimetres (125.3 in) in the period 1901-2015. African descent 92.5%, Multiracial 3%, European 2.1%, Indian 1.5%, Other 0.6%, Unspecified 0.3% (2001 estimate). As of 2016[update], there were 54,821 inhabitants; their average life expectancy is 76.9 years. Emigration has historically been very high, so high that the total estimated population in 2007 was little changed from that in 1961. Most inhabitants are Christians, mainly Anglicans and other Protestants. The Roman Catholics are pastorally served by the Roman Catholic Diocese of Bridgetown (on Barbados), while the Anglicans by the Diocese of the North East Caribbean and Aruba. English is the sole official language. Saint Kitts Creole is also widely spoken. Saint Kitts and Nevis is known for a number of musical celebrations including Carnival (18 December to 3 January on Saint Kitts). The last week in June features the St Kitts Music Festival, while the week-long Culturama on Nevis lasts from the end of July into early August. Additional festivals on the island of Saint Kitts include Inner City Fest, in February in Molineaux; Green Valley Festival, usually around Whit Monday in village of Cayon; Easterama, around Easter in village of Sandy Point; Fest-Tab, in July or August in the village of Tabernacle; and La festival de Capisterre, around Independence Day in Saint Kitts and Nevis (19 September), in the Capisterre region. These celebrations typically feature parades, street dances and salsa, jazz, soca, calypso and steelpan music. The 1985 film Missing in Action 2: The Beginning was filmed in Saint Kitts. Cricket is common in Saint Kitts and Nevis. Top players can be selected for the West Indies cricket team. The late Runako Morton was from Nevis. Saint Kitts and Nevis was the smallest country to host 2007 Cricket World Cup matches. Rugby and netball are also common in Saint Kitts and Nevis as well. The St. Kitts and Nevis national football team, also known as the "Sugar Boyz", has experienced some international success in recent years, progressing to the semi-final round of qualification for the 2006 FIFA World Cup in the CONCACAF region. Led by Glence Glasgow, they defeated the US Virgin Islands and Barbados before they were outmatched by Mexico, Saint Vincent and the Grenadines, and Trinidad and Tobago. Despite not representing the country, Marcus Rashford is of descent. The St. Kitts and Nevis Billiard Federation, SKNBF, is the governing body for cue sports across the two islands. The SKNBF is a member of the Caribbean Billiards Union (CBU) with the SKNBF President Ste Williams holding the post of CBU Vice-President. Kim Collins is the country's foremost track and field athlete. He has won gold medals in the 100 metres at both the World Championships in Athletics and Commonwealth Games, and at the 2000 Sydney Olympics he was the country's first athlete to reach an Olympic final. He and three other athletes represented St. Kitts and Nevis at the 2008 Summer Olympics in Beijing. The four by one hundred metre relay team won a bronze medal in the 2011 world championships. American writer and former figure skater and triathlete Kathryn Bertine was granted dual citizenship in an attempt to make the 2008 Summer Olympics representing St. Kitts and Nevis in women's cycling. Her story was chronicled online at ESPN.com as a part of its E-Ticket feature entitled "So You Wanna Be An Olympian?" She ultimately failed to earn the necessary points for Olympic qualification. St. Kitts and Nevis had two athletes ride in the time trial at the 2010 UCI Road World Championships: Reginald Douglas and James Weekes. Saint Kitts and Nevis is a twin-island federation whose economy is characterised by its dominant tourism, agriculture, and light manufacturing industries. Sugar was the primary export from the 1940s on, but rising production costs, low world market prices, and the government's efforts to reduce dependence on it have led to a growing diversification of the agricultural sector. In 2005, the government decided to close down the state-owned sugar company, which had experienced losses and was a significant contributor to the fiscal deficit. Former sugar plantations dominate the St. Kitts landscape. Many of the cane fields are being burned to make room for land development, especially on the northern side of the island, in the parishes of Saint John Capisterre and Christchurch. The agricultural, tourism, export-oriented manufacturing, and offshore-banking sectors are being developed and are now taking larger roles in the country's economy. The growth of the tourism sector has become the main foreign exchange earner for Saint Kitts and Nevis. The country has also developed a successful apparel assembly industry and one of the largest electronics assembly industries in the Caribbean. St. Kitts is dependent upon tourism to drive its economy. Tourism to the island has been expanding since 1978. In 2009 there were 587,479 arrivals to Saint Kitts compared to 379,473 in 2007. This growth represents an increase of just under 40% in a two-year period. As tourism grows the demand for vacation property increases in conjunction. In hopes of expanding tourism, St. Kitts hosts its annual St. Kitts Music Festival. St Kitts & Nevis also acquires foreign direct investment from their citizenship by investment programme, outlined in their Citizenship Act of 1984. Interested parties can acquire citizenship if they pass the government's background checks and make an investment into an approved real estate development. In July 2015, St Kitts & Nevis and the Republic of Ireland signed a tax agreement to "promote international co-operation in tax matters through exchange of information." The agreement was developed by the OECD Global Forum Working Group on Effective Exchange of Information, which consisted of representatives from OECD member countries and 11 other countries in the Caribbean and other parts of the world. Saint Kitts and Nevis has two international airports. 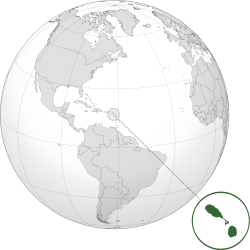 The larger one is Robert L. Bradshaw International Airport on the island of Saint Kitts with service outside to the Caribbean, North America, and Europe. The other airport, Vance W. Amory International Airport, is located on the island of Nevis and has flights to other parts of the Caribbean. St. Kitts allows foreigners to obtain the status of St. Kitts citizen by means of a government sponsored investment programme called Citizenship-by-Investment. Established in 1984, St. Kitts' citizenship programme is the oldest prevailing economic citizenship programme of this kind in the world. However, while the programme is the oldest in the world, it only catapulted in 2006 when Henley & Partners, a global citizenship advisory firm, became involved in the restructuring of the programme to incorporate donations to the country's sugar industry. Citizenship-by-Investment Programmes are criticised by various researchers because of its risks of corruption, money laundring and tax evasion. According to the official website of St. Kitts' Citizenship-by-Investment Programme they offer multiple benefits: "When you acquire citizenship under the St. Kitts & Nevis citizenship programme, you and your family enjoy full citizenship for life, which can be passed on to future generations by descent. As citizens of St. Kitts & Nevis, you and your family are issued with passports which allow visa-free travel to more than 130 countries territories worldwide, including all of the EU. Of course you have the right to take up residence in St. Kitts & Nevis as well as in most of the CARICOM member countries at any time and for any length of time". Each candidate must go through several legal steps and make a qualifying investment into the country and should complete certain legal requirements to qualify for citizenship under the investment programme. There is a minimum investment that has to be made by the applicant, in either an approved real estate or in the Sugar Industry Diversification Foundation (a public charity), to qualify for the economic citizenship of St. Kitts & Nevis. The latest data indicates an acceleration in property appreciation when comparing it to the Department of Inland Revenue's 2009 statistics. There are eight publicly administered high and secondary level schools in St Kitts-Nevis, and several private secondary schools. ^ "1983 Saint Kitts and Nevis Constitution". pdba.georgetown.edu. Retrieved 30 August 2017. ^ Hubbard, Vincent (2002). A History of St. Kitts. Macmillan Caribbean. p. 10. ISBN 9780333747605. ^ Cobley, 1994, p. 28. ^ a b Cobley, 1994, p. 27. ^ Jonnard, Claude M. (2010). Islands in the Wind: The Political Economy of the English East Caribbean. Bloomington, IN: iUniverse. p. Page number not available. ^ Du Tertre, Jean-Baptiste. Histoire générale des Antilles habitées par les François, 2 vols. Paris: Jolly, 1667, I:5–6. ^ "St Kitts History". Beyondships Cruise Destinations. ^ "St Kitts and Nevis : History". ^ "Nevis islanders apparently vote not to break away". Milwaukee Journal Sentinel. Associated Press. 11 August 1998. ^ "Art. 1, Federation of Saint Kitts and Nevis Constitutional Order of 1983". Pdba.georgetown.edu. Retrieved 2014-07-08. ^ OEA; OAS (1 August 2009). "OAS - Organization of American States: Democracy for peace, security, and development". Oas.org. Retrieved 30 August 2017. ^ OAS (1 August 2009). "OAS - Organization of American States: Democracy for peace, security, and development". Oas.org. Retrieved 30 August 2017. ^ a b "Indigenous Peoples". Summit-americas.org. Retrieved 30 August 2017. ^ "Working Group to Prepare the Draft American Declaration on the Rights of Indigenous Peoples". Oas.org. Retrieved 30 August 2017. ^ a b c "Legal Supplement Part B - Vol. 33, No. 273 - 28th December, 1994 : LEGAL NOTICE NO. 232 : REPUBLIC OF TRINIDAD AND TOBAGO THE INCOME TAX ACT, CHAP. 75:01 : ORDER MADE BY THE PRESIDENT UNDER SECTION 93(1) OF THE INCOME TAX ACT : THE DOUBLE TAXATION RELIEF (CARICOM) ORDER, 1994" (PDF). Ird.gov.tt. Retrieved 30 August 2017. ^ "Foreign Account Tax Compliance Act (FATCA)". Treasury.gov. Retrieved 30 August 2017. ^ a b "Homepage". Uscis.gov. Retrieved 30 August 2017. ^ Denis Lepage (9 January 2013). "Avibase - Bird Checklists of the World Saint Kitts". Avibase. Retrieved 27 November 2017. ^ "Climate of Saint Kitts and Nevis: Temperature, Climograph, Climate table for Saint Kitts and Nevis - Climate-Data.org". Climate-data.org. Alexander Merkel. Retrieved 15 March 2018. ^ a b "Country Historical Climate - St. Kitts & Nevis". Climate Change Knowledge Portal. The World Bank Group. Retrieved 15 March 2018. ^ "Table 5: Estimates of Mid-year Population: 2007–2016" (PDF). United Nations Demographic Yearbook: 2016. United Nations. 2017. p. 2. ^ "CARICOM CAPACITY DEVELOPMENT PROGRAMME (CCDP) : 2000 ROUND OF POPULATION AND HOUSING CENSUS SUB-PROJECT NATIONAL CENSUS REPORT : ST. KITTS AND NEVIS" (PDF). Caricomstats.org. Retrieved 30 August 2017. ^ "Missing in Action 2-The Beginning Review". Movies.tvguide.com. Retrieved 2 November 2011. ^ "St Kitts ramps up to host ICC Cricket World Cup in 2007". Caribbean.com. Retrieved 2016-11-22. ^ "E-ticket: So You Wanna Be An Olympian, Part 13". ESPN.com. Retrieved 30 August 2017. ^ Rob Jones. "UCI Road World Championships 2010: Elite Men Results - Cyclingnews.com". Cyclingnews.com. Retrieved 2016-04-07. ^ "St.Kitts-Nevis and the Republic of Ireland sign Tax Agreement". Ntltrust.com. Retrieved 30 August 2017. ^ "Citizenship-by-Investment Introduction". Retrieved 17 June 2013. ^ Abrahamian, Atossa Araxia. The Cosmopolites: The Coming of the Global Citizen. Columbia Global Reports. ISBN 978-0-9909763-6-3. ^ Shachar, Ayelet (2017). Citizenship for Sale? In: The Oxford Handbook of Citizenship. Oxford University Press. pp. 789–816. doi:10.1093/oxfordhb/9780198805854.013.34. ^ "Visa Restriction Index 2006 to 2016". Visaindex.com. Retrieved 2016-07-20. ^ a b "Saint Christopher & Nevis Citizen by Investment Regulations" (PDF). Ciu.gov.kn. Archived from the original (PDF) on 16 August 2013. Retrieved 17 June 2013. ^ Kalin, Christian H. (2015). Global Residence and Citizenship Handbook. Ideos Publications. ISBN 978-0992781859. ^ "Citizenship Investment in St. Kitts and Nevis - Henley & Partners". Henleyglobal.com. Retrieved 2016-07-20. Cobley, Alan Gregor; Department, University of the West Indies (Cave Hill, Barbados). History (1994). Crossroads of Empire: The European-Caribbean Connection, 1492-1992. Department of History, University of the West Indies. ISBN 978-976-621-031-1. "Saint Kitts and Nevis". The World Factbook. Central Intelligence Agency.